2:46p.m on March 11, 2011, the devastating earthquake and tsunami hit the Tohoku district in Japan. More than 19,000 people were killed in this disaster and many are still missing. Not only was there great damage, but also many who suffered have also lost their jobs. This is especially true of the fish industry; it is very serious. According to Stars and Stripes reporters, Norimitsu Kobayashi, who is a government official promoter of commercial fishing in Miyagi, said the there is likely 400 billion yen, or $5 billion worth of damages. “The industry is almost completely destroyed,” he said. It had a very big influence on the economy. Much equipment was destroyed by the tsunami, and most cultivated fish and shellfish died, not to mention the damaging effects of radiation on the ocean. Fishermen and the industry must now face the challenge of how to rebuild. Today, sufferers are still exposed to massive radiation in the devastated area. I, Erika Tsuji,an international student from Japan and involved in volunteer work at the Cannery, went to Fukushima to volunteer last summer. The Fukushima first nuclear plant explosion brought mass chaos. That area showed high radiation levels; people couldn’t go outdoors and it was recommended that children stay inside for most of the day, as they were most at risk. They were only allowed outdoors for approximately 3 hours a day. My job as a volunteer was to watch over and take care for the children during their time outside. I took them hiking or to the indoor pool. I also played with them and did craft activities like origami, drawing, and more. We also made udon for the survivors in care. In addition, I listened to survivors’ stories to aid in their healing process. I learned many things from the survivors and other volunteers. It was surprising to me that many people came to the disaster area from all over the world to volunteer. It touched my heart that they were so full of warmth. 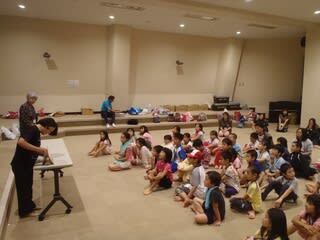 I still keep in touch with the children who live in Fukushima and other volunteers. My volunteer experience is very precious to me. Therefore I’m very happy to be involved in the Steveston walk project as a volunteer because I want to continue supporting the survivors. I hope many people take part in this project and think about how terrible that disaster was. We can help each other from all over the world. Join the Steveston Cares Walk on Sunday, March 25th. One kilometre walks will start in Fisherman’s Park at 10 am and will depart every hour thereafter. The last walk leaves at 2 pm. Proceeds raised will support the children of Onagawa, Japan.